Anyone in this area will know the famous Glen Road. We would like to take you on a short tour through this famous Road. 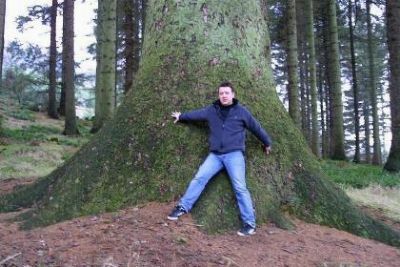 You will use part of it when you come to the Drumtochty Highland Games. 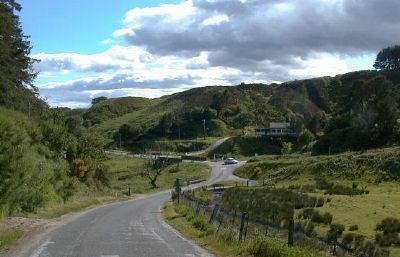 After driving through Auchenblae, on top of the Village you will see a sign pointing to Drumtochty Glen, Clatterin Brig. Just following the road, the first astonishing sight is the Church of St. Palladius. 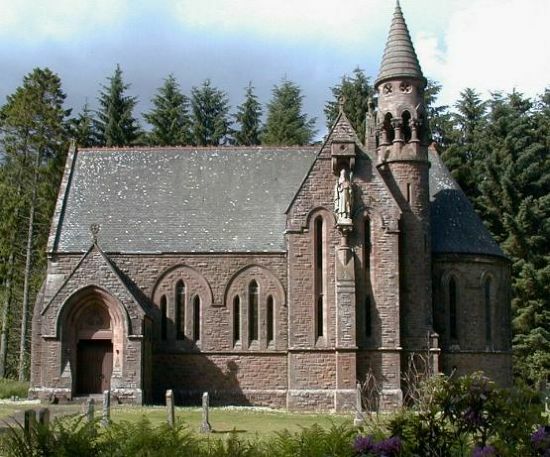 The Church was build by the Gammells. The Gammell family bought Drumtochty Castle in 1822 and owned it for almost a century. Their sons and great-sons followed a military career and lived more in London than Scotland. 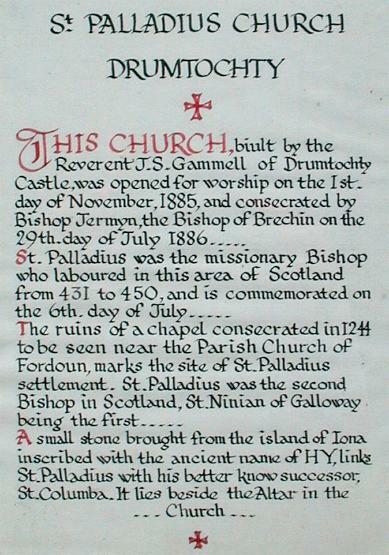 It was James Stewart Gammell, who held various ecclesiastical appointments in England, returning to Drumtochty to take up his inheritance, who build the Church. 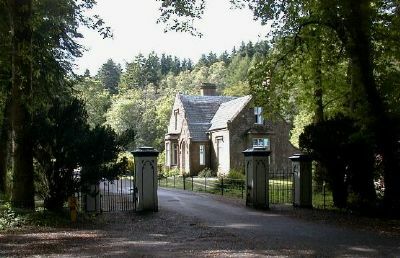 Next to the church is the entrance to Drumtochty Castle. It was George Harley Drummond, a member of a well known banking family of Charing Cross, London, who bought in 1807 the estate of Dillievaird from Lord Kintore. In 1810 he purchased further lands from Viscount Arbuthnott, but what he really was after, and bought at the same year, was the site of Mrs. MacKenzie's House of Woodstock, described some years later as a snug and unpretentious cottage. 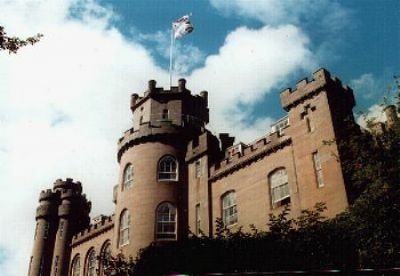 In place of this modest dwelling, Drummond planned to erect a large mansion in the then fashionable castellated neo-Gothic style and he engaged the services of a young Edinburgh architect with a growing reputation - James Gillespie Graham. 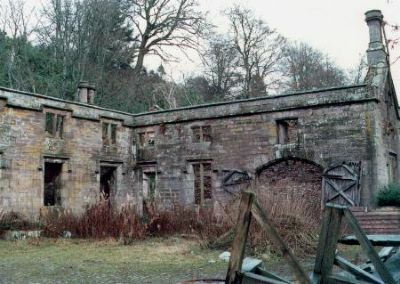 Just after the Games Fields you will catch a glimpse of the "Stables"
Naturally an Estate like Drumtochty Castle needed big Stables for Horses and Carriages plus the accommodation for all the stable staff to provide a 24hours service, but in modern times there was no need for these services anymore and the building disused, soon became derelict. Just over 10 years ago rebuild in traditional style and converted into modern Flats and Apartments the "Stables" provide now very much sought after accommodation. Next to the "Stables" you will see the sign for the "Forestry Car Park"
A picnic area with toilet facilities, walkways, Horse trails, bike and mountain-bike tracks and lots of other facilities for everyone to enjoy. Carry on the Glen Road and you will come to "Loch Saugh". 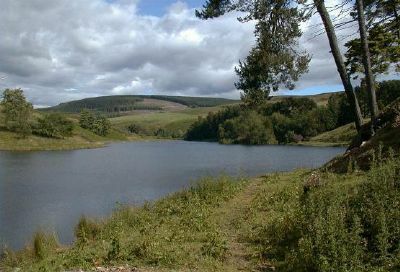 Originally a man-made Loch it has over the decades been embraced by the Countryside and become part of it. 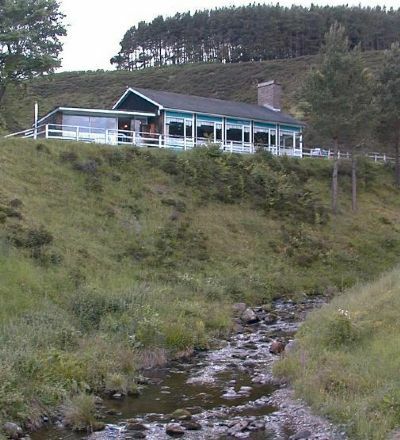 Well stocked with Trout it attracts a number of Anglers and is now run by Brechin Angling Club. Seemingly formed by nature for the accommodation and encouragement of picnicing parties, and has, moreover, the additional attraction of an ancient fortification. To-day you will find a convenient Restaurant here. The bridge itself was rebuild in 1961 and legend has it that "Bonny Prince Charles" walked once his men over it. Here, we may say, lies the boundary between Lowlands and Highlands, if you turn left you come to Fasque and Fettercairn turn right and you start the climb to the Cairn o’ Mount, leading to Banchory and Deeside. 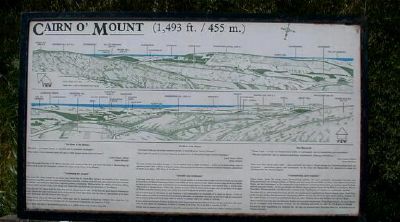 Written just below the Cairn. Some of you may ask - Now what is a Cairn? pile of stones, usually conical in shape, raised as a landmark or a memorial. In prehistoric times it was usually erected over a burial. A barrow is sometimes called a cairn. 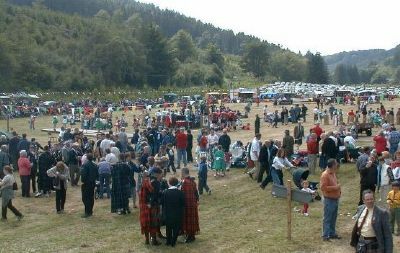 Now you know a bit more about the area around the Drumtochty Highland Games. 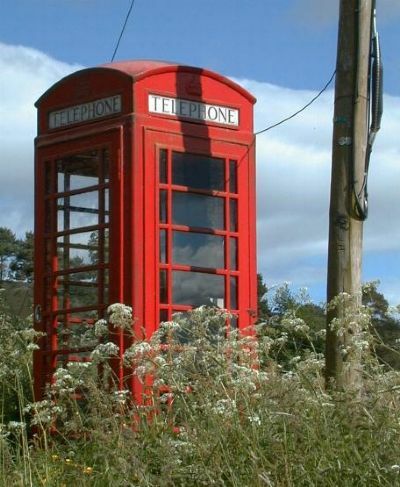 You also know that you can reach us via Fettercairn or Banchory over the Cairn 'o Mount . You have no excuses to miss the next Games. We look forward to welcoming you.